Can you believe it? It's April! And you know what that means, right? Spring is here COUGAR TOWN RETURNS SOON!! Sorry, I'll try to compose myself. In just 10 short days, Cougar Town returns to ABC in a special, one-time-only post-Dancing with the Stars timeslot on Monday, April 18 at 9:30pm/EST, and then back to its normal timeslot on Wednesday, April 20 at 9:30pm/EST. It's been rough getting through this hiatus, but we have Vulture to thank for giving us the Cougar Town: Writers vs. Actors web series to help get us through it. The star of the show? 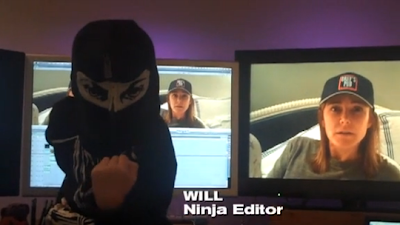 Obviously Bill and Christa's son Will, the ninja editor.